In my new life as a wine tour guide I spend a lot of time behind the scenes at wineries talking to winemakers owners and marketing staff. They alert me to upcoming releases of wines , vineyard acquisitions and all sorts of new things happening in the Okanagan wine scene. This invariably leads to discussions with the tour guests about what’s happening in the industry. I try to focus the discussion on trends that increase the wine quality or that raise the profile of the BC wine industry in a more general way. One of the major trends in BC is wineries that explore the concept of Terroir . Terroir is a French word that means sense of place. It’s your vineyards aspect to the sun, soil type, diurnal temperature changes (daytime to nighttime ) and anything else that is different than your neighbour . If you can demonstrably show that your piece of dirt is significantly unique from another winery and makes a noticeable difference to the flavour , aromatics or structure to the wine you make you can legitimately charge more for the wine. In business we call that a unique selling proposition. This process has been under way in BC for awhile with varying degrees of success. Why didn’t we do it right at the start of our wine industry ? The answer is it didn’t matter until it did matter. Cryptic huh ? When our industry was in it’s infancy Terroir was a detriment to it as we didn’t have the experience that well known Terroir regions of the world like France and Italy had. So the solution was to say it didn’t matter and that we were every bit as good as any other country ( even if we weren’t ) . With increased numbers of wineries and vineyards in BC we then had to stand out from our neighbouring winery. The best way to do that is to then say my piece of dirt is better than my completion down the street or down the valley. The viticulturists started to do soil pit tests, ground penetrating radar analysis and sophisticated temperature recording and modelling. The winemakers started identifying the specific Terroir locations on the properties and vinifying the lots separately . Suddenly they started to realize certain batches were more aromatic, deeper in colour or had a structure that would allow them to age longer. This experimentation leads to the identification of the best spots and Voila ! Single vineyard wines are born, you can charge more for your wine, brand expansion happens and if the market agrees with your assessment then your price for the vineyard can be substantially more when you sell. Who does this well in British Columbia ? I’ll give you one example Synchromesh Winery in Okanagan Falls. Alan Dickinson is making world class Riesling that are unique , flavorful and compete with some of the best wines in the world. Buy them cellar them and thank me later. Just leave some for me. Gruner Veltliner isn’t exactly a grape variety that comes to mind when you are thinking of classic age worthy wines. If it isn’t in your repertoire it deserves to be. Gruner Veltliner or Gruve ( as all the cool kids call it ) is an unrecognized superstar in the age worthy white wine category. Many years ago in my other life I attended a lecture at the Society of Wine Educators Conference in Vancouver BC. The keynote speaker was Terry Theise. Terry is the import partner for a high quality importer in the United States called Skurnik Wines. I have long considered this agent the premiere National importer of European wines to the US. Terry showed us wines the Austria that had not been available in our market for years. A scandal in the Austria wine market meant there was a long period with no availability of the wines in many parts of the world. He poured us 20 year old Gruner Veltliner that was clean and showed very little oxidation. It was reminiscent of great aged Chassagne Montrachet. I was stunned and the room positively vibrated with excitement . We immediately made plans for Austrian wines to be a part of the Marquis Wine Cellars offerings. Producers such as Nigl, Prager, Solomon and Kracher became a staple in the store. That got me thinking about Gruve and other places it might do very well. Mendocino or Santa Barbara might be possible locations but how about closer to home ? There was a time when I thought it might do well in Naramata and I actively lobbied a winery there to plant it with no success . I shelved the idea and went back to doing what I do best ,selling wine. Then what do you know ? I started to see a few people testing it out . Currently I know of 4 places it’s planted , De Vine in Saanich ( not currently listed on their website ) Border Town , Summerhill and Culmina. 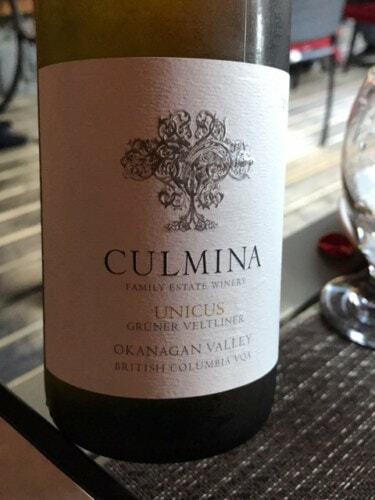 While I have not tasted the first 3 lately I have tried the Culmina Wines since the first release and they have impressed me a lot. Fresh and clean with a nice bright core of acid and enough texture that would lead me to believe they could age 10-15 years. Check out Culmina at http://www.culmina.ca/ And buy some. They say up to 3 years aging . I think this could and should go much longer. If you have any feedback we would love to hear from you on our Facebook page. https://www.facebook.com/winecellardepot/.